2015 was a milestone year. I created 25 YouTube videos and raised nearly $10,000 on Kickstarter for my documentary about Moe’s Books, New Mo’ Cut. I filmed and edited over the summer and premiered it at the Elmwood Theater in August. New Mo’ Cut’s first festival and Arizona premiere was at the Loft Film Festival in Tucson and in December, NMC won Best Editing at the 6th annual Filmstock Film Festival in Tempe. Arizona loves Moe. I’m thrilled it’s going beyond Berkeley and am deeply grateful for the family, friends and community that came together to make it a reality. Speaking of reality! This year I’m excited about 360 video and the arrival of Virtual Reality headsets. I’ll be hosting more OffPlanet VR demo meet ups and am collaborating with Oakland’s psychedelic dream-pop band Snow Angel on a 360/VR music video for the spring release of the their new album and cassette. 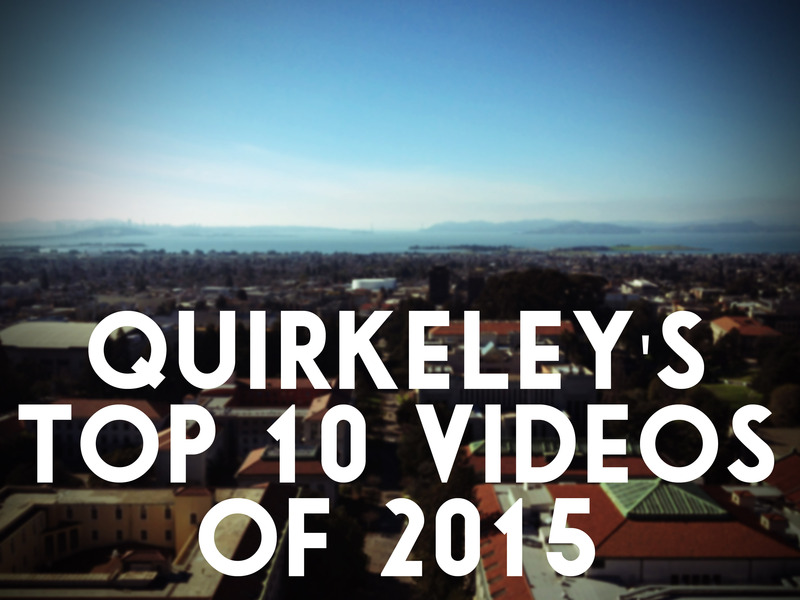 Now here are the top 10 most viewed YouTube videos I produced this year for Quirkeley. They all mark the progression of New Mo’ Cut in some way and are sweet reminders that adventure is all around Berkeley. Our first video of 2015 was also our most popular. Although Quirkeley easily gets confused with Tom Dalzell’s Quirky Berkeley, his site arrived first. Quirky Berkeley is an impressive catalogue of the artistic oddities Dalzell encounters as he fulfills his personal challenge to walk every block in Berkeley. Last we heard he has just a few miles left. Dalzell treated us to a tour of his top “quirky manifestations” including the garden sculptures of Buldan Seka, Bruce Dodd’s giant orange stand, and Mark Olivier’s beach detritus art. A walk in Berkeley is always good for strange and magical encounters. Every January Berkeley Restaurant Week offers diners the chance to explore new flavors at special savings with prix fixe menus at over twenty locations in 2016. Last year we partnered with Visit Berkeley and went to Rivoli, Bistro Liaison and newcomer Longbranch Saloon (now Longbranch) to find out the inspiration behind their Restaurant Week menus. All three restaurants are participating again along with The Advocate, Easy Creole, Mission Heirloom and more. When 40-year-old Nabolom Collective Bakery went out of business in early August I was consumed with finishing New Mo’ Cut in time for its Elmwood Theater premiere at the end of the month. Nabolom was a favorite in the neighborhood and had a good sidewalk vibe. I got the warm and fuzzies whenever I saw their painted wood sign even though I wasn’t a regular. Luckily I was able to duck out of editing for a spell to enjoy the last of their baked goods and live music by Friends of Old Puppy. I hurriedly made this montage from what I could capture. Filmmaking is stealing time. During my stint as the Marketing Coordinator for the Downtown Berkeley Association I had fun producing Berkeley’s first Valentine’s Day CupidCon bar crawl, Instagram scavenger hunt and costume contest with former Marketing Director Shifra de Benedictis-Kessner (now the Executive Director of the Temescal Telegraph BID). Hundreds of revelers toured Downtown bars and restaurants to explore themed cocktails and post silly Instagrams to our BerkCupidCon hashtag. In this #Berkeley episode Monroe (Sarah Aguirre) guides us through the CupidCon drink specials at La Botella Republic, Five Restaurant and Bar and the now closed Build Pizzeria. Grab a pair of rose-colored glasses. While working with David Peoples on New Mo’ Cut he told me about Jugger, the game he invented for his 1989 post-apocalyptic film Blood of Heroes aka Salute of the Jugger. Since the film’s release the contact sport has adopted a global cult following with tournaments taking place in the US, Europe and Australia. Peoples introduced me to Evan and Valkirie Savage who brought Jugger to Berkeley from Germany and started the Berkeley Riot team. Pummeling your opponent never looked so much fun. Here’s their meetup page. They’ve recently expanded to San Francisco. Quirkeley’s holiday series for Buy Local Berkeley is one of my favorite to make because I get to interview the city’s intrepid shop keepers, learn about their craft and the gumption it takes to be an entrepreneur in Berkeley. There’s a story behind every neighborhood and address. Last year’s guide led me to Doris Moskowitz owner of Moe’s Books which sparked my New Mo’ Cut adventure. This episode takes us to the Dazzling Holiday Lights on 4th Street and features gift ideas from The Stained Glass Garden, Metro Lighting, Pegasus Books and Boss Robot Hobby. Last summer we mixed and mingled with some of YouTube’s biggest stars and pioneers of viral video including Tay Zonday of Chocolate Rain fame, at the 6th annual VidCon in Anaheim, California. The largest gathering for online video makers on the planet, VidCon is like being in a YouTube summer camp at Disneyland or a near future sci-fi film. Many attendees live-stream from their phones on selfie sticks as they’re walking around. The sell-out event with industry keynotes, panels and workshops puts into focus the takeover of mobile video, gaming and now, Virtual Reality. Get your tickets for 2016! The YouTube phenomenon of unboxing and ASMR videos (Autonomous Sensory Meridian Response – sounds that give you the tingles) inspired Sarah Aguirre (as Monroe) and I to create this unboxing/ASMR mashup using Kinder surprise eggs we found at a convenience store in Downtown Berkeley. We had a lot of fun making it but I kept thinking, I went to film school for this. Tom Dalzell is back with more quirky manifestations. We visit Eni Green’s Doggie Diner Head and Eugene Tsui’s radical Tardigrade House in West Berkeley. Thanks for the tour Tom! Grumpy Cat gets an all-star welcome to Berkeley Humane as they celebrate the ribbon cutting of their new mobile adoption center and winning Chronicle Books’s #GrumpyTownUSA contest. It was awful. “Frown and the whole world frowns with you.” – Grumpy Cat. Happy New Year! Subscribe to Quirkeley on YouTube for local, fresh and organic videos. Follow us on Twitter @Quirkeley and like us on Facebook.